What is UV Acrylic? 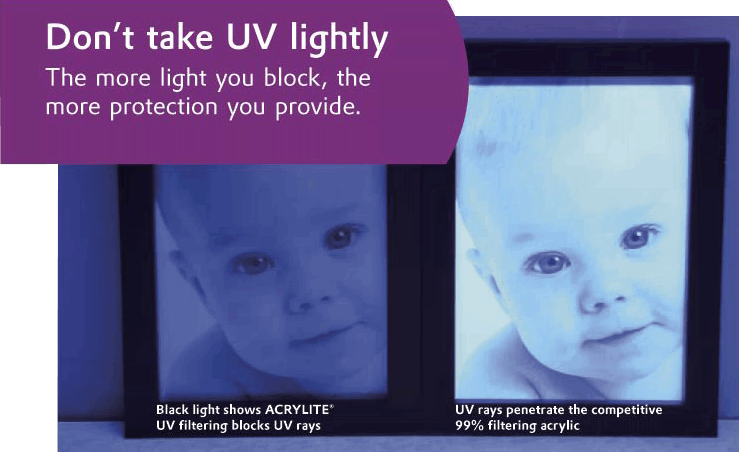 UV Acrylic is used to block harmful UV rays to help protect your collectible. Fabrics and paper become brittle, fade in color, or turn yellow when exposed to sunlight. Those changes are mainly due to exposure to the UV-light in solar radiation Cellulose fibers, from which paper is made, are particularly sensitive to UV-radiation. What standards are there for picture framing acrylic? 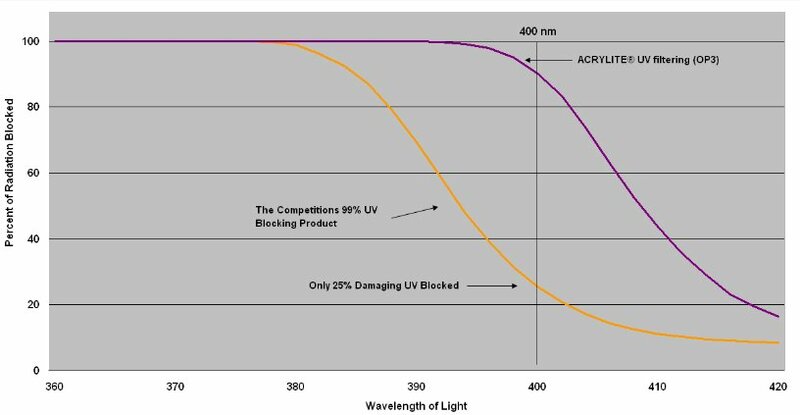 The ASTM D 4802 standard defines UV filtering as limiting the transmission of UV radiation through the acrylic sheet to less than 5% in the 200nm to 400nm range (i.e. blocking greater than 95% of the UV light). Conservation Grade UV protection meets the ISO 18902 standard and passes the ISO 18916 standard by blocking at least 97% of UV energy. These standards apply to both UV Acrylic (OP3/ Conservation Clear) and UV/NG Acrylic (OP3 P99/Conservation Reflection Control). All the UV Acrylic that I sell meets these standards. It is difficult for the consumer to effectively compare brands of UV Acrylic. That's because it isn't something that can be easily measured or seen by the buyer. Because of that its easy to make claims about UV Blocking Acrlic that are not accurate and can lead to damage from UV exposure. Some times, narrow UV light ranges and thicker acrylic sheet measurements are used to boost the claim of UV filtering performance. There is a standard, ASTM D 4802 that defines UV Filtering as limiting the transmission of UV Radiation through the acrylic sheet to less than 5% in the 200nm to 400nm range. This equates to a 95% blocking rate. Some products may start out at the 95% rate but rapidly deteriorate as the wavelength rises into the most dangerous zones as shown in the graph below. So how can you protect yourself from inferior products that may not protect your collectibles. Ask. Ask who is the manufacturer of their UV Acrylic. Ask if their acrylic meets thge ASTM D 4802 standard as well as the IS 18902 and 18916 standards. Ask them to show you the Technical Specification Sheet showing the performance of their UV Product, especially the data graph like the one below. If the UV Acrylic you are considering seems to be low cost there are two old caveats that apply.